In both Missouri and Illinois, both employers and employees who have had an adverse determination made regarding unemployment benefits can appeal that decision. Employers in both states have a significant financial incentive to prevent employees who should not be receiving unemployment benefits from obtaining them, while these same benefits may be financially crucial to employees who have lost their benefits through no fault of their own. In Missouri, the agency responsible for the administration of unemployment benefits is the Missouri Department of Labor & Industrial Relations Division of Employment Security, while in Illinois the analogous agency is the Illinois Department of Employment Security. Successfully appealing a denial or award of unemployment benefits can be a complicated process, and our experienced lawyers know how to avoid common mistakes and maximize your chances of obtaining a favorable result. Employers have a significant financial incentive to prevent employees who should not be receiving unemployment benefits from obtaining them. Fortunately, attorney Kenneth P. Carp is a skilled unemployment benefits advocate who has experience represent both employers and employees in every aspect of the unemployment claims process. 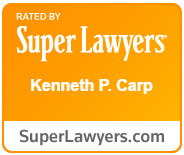 To schedule a free consultation with one of our experienced lawyers, call the Law Offices of Kenneth P. Carp today at 636-947-3600. While both Missouri and Illinois are quick to advise potential parties to an unemployment benefits appeal hearing that they are not required to be represented by counsel, the assistance of an attorney can help maximize your chances of obtaining a favorable result in your case. Whether you are an employer protesting an award of unemployment benefits or an employee seeking to obtain them, attorney Kenneth Carp can make sure that you present the strongest case possible. To schedule a free consultation with one of our lawyers, call our office today at 636-947-3600.